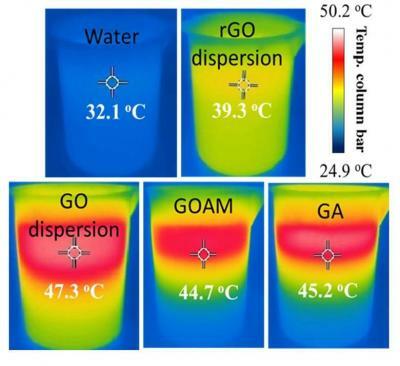 Researchers at the Chinese Hubei University have designed a graphene aerogel film capable of producing water vapor at room temperature using only sunlight. The aerogel floats on the surface, where it heats up only a small part of the water column, ‘while the temperature of the bulk water is far below the boiling point’, the team explains. This sunlight-harvesting graphene film could convert sea or wastewater into drinking water in places where fuel or access to electricity is limited. Desalinating seawater to make it drinkable usually means boiling it, and then collecting and condensing the steam. Heating water to its boiling point, however, requires quite a lot of energy, which is not always easy to come by. There are solar stills that desalinate water using only sunlight, but they’re slow and not always efficient enough to provide sufficient drinking water for a person’s daily needs. The team showed that under simulated sunlight, the aerogel could heat up 100ml of water to 45°C, about 13°C higher than water without the aerogel. The material’s porous structure pumps the generated steam away from the surface, allowing water to evaporate 13 times faster than it would without the aerogel. While other steam-generating materials are based on expensive raw materials such as gold, the basis for this aerogel is powdered graphite – which is a cheap and widely available resource. Generating solar steam with the graphene aerogel could be more efficient than using electricity from a photovoltaic cell. ‘The efficiencies of commercial photovoltaic cells are 10–20%, such that the efficiencies of generating steam using photovoltaic cells cannot exceed 20%,’ explain the researchers. This floating graphene has an efficiency of 54%, reaching up to 83% under focused sunlight. The team noted, however, that for the material to be used in a desalination device, it will need to have improved toughness – it is currently easily broken when picked up. ‘I do not see fundamental difficulties in bringing the current technology into real-life applications, although much more feasibility studies should be done,’ adds a member of the team. In October 2016, scientists at Washington University developed a technique for using sheets of graphene oxide to obtain drinkable water using sunlight; The technique involves heating dirty water to a boil - creating purified steam that can be collected and safely consumed.